Soccernomics Agency: Consultancy, Research, Ideas » World Cup 2018 Prediction Evaluation: Got Skill? World Cup 2018 Prediction Evaluation: Got Skill? Sport tournaments offer a great laboratory to see if we as smart as we think we are by giving us the chance to predict the future. In 2014 I evaluated 12 different predictions for how the World Cup matches would turn out. For World Cup 2018 in Russia I have identified 8 different rankings of all 32 World Cup teams that I will use in a similar prediction evaluation exercise. Many of those who produced predictions for 2014 have not done so (that I can find) for 2018. Perhaps this has something to do with the fact that in 2014 10 of 11 predictions were unable to perform better than the FIFA rankings. Here is how my evaluation effort will proceed. Using the 8 sets of rankings, I will score 1 point for every match that the higher ranked team wins. Each ranking system will then have 48 possible points in the group stages and an additional 15 possible points in the knockout phase of the tournament. The top forecasters in 2014 scored 45 points, just edging the FIFA Rankings which had 44. Of course, not every person or group who produced the rankings would represent them as a means to skillful prediction. Indeed, if such prediction was readily possible such predictors would be wagering money, not making predictions. Even so, it is fun and instructive. 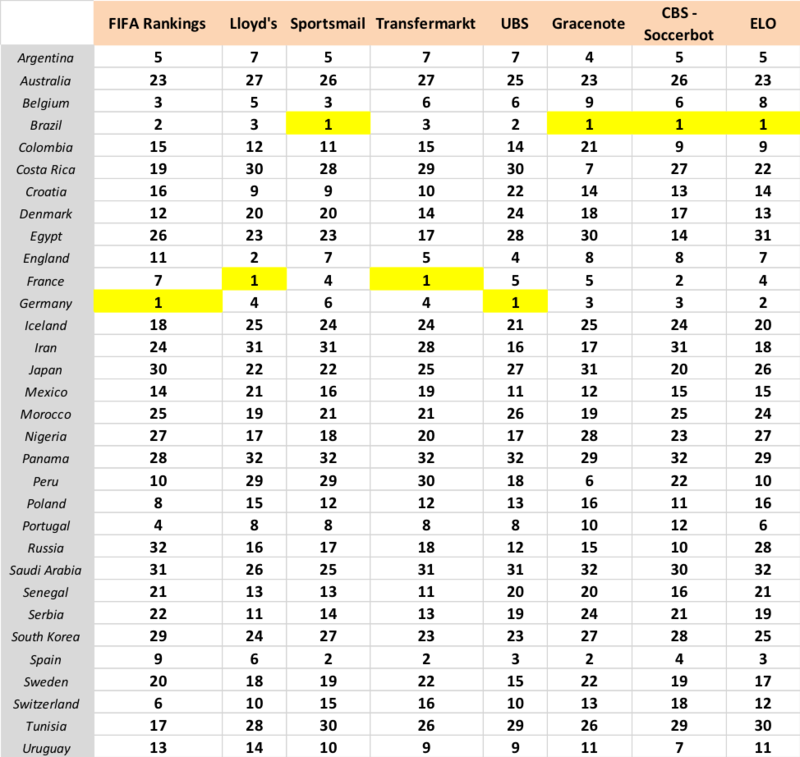 Here then are the eight sets of rankings that I’ll be tracking, with the top team identified in yellow for each: Brazil, France and Germany are identified as the likely winners. Of course, we would be wise to note that none of the 12 predictions I tracked in 2014 had Germany as the winner. I’ll be tracking the predictions on Twitter @RogerPielkeJr and will be back here with a post-mortem. If you are aware of other rankings 1-32 of teams, send those along and I’ll add to the mix. Who will win the prediction evaluation World Cup in 2018? Put me down for the FIFA Rankings.